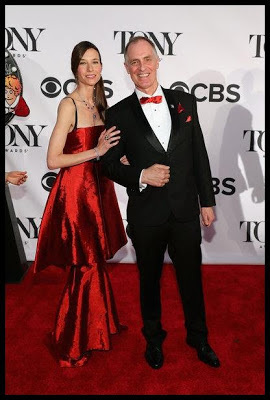 Tony Nominee, Keith Carradine, and wife Hayley both wear Malan Breton designs to the 2013 awards presentation. Choreographer Jerry Mitchell accepts the Tony wearing a Malan Breton HOMME Suit. Heather Graham looks gorgeous in this Kymerah dress designed by Project Runway Season 5 contestant, Daniel Feld. Hometown media sources are proud to claim season 12 designers as their own. Click here to learn more about Timothy Westbrook. Click here for more about Miranda Levy. Click here to learn more about Dom Streater. In addition to providing accessories for the runway, Belk provides the opportunity for a fan to win a Facebook sweepstakes prize which includes a "Trip to New York to see a taping of Project Runway." Also, Belk will sponsor a "Modern. Southern. Style." challenge and a Belk executive will serve as judge. Please stay tuned for details and click here for the full press release. Project Runway All-Star Designer, Austin Scarlett, presents his 2013-14 Bridal Collection. Alexander is 38 and lives in Ridgewood, NY. Click here for Alexander's website. Click here for Alexander's Facebook page. Alexandria is 38 and lives in San Mateo, CA. Click here for Alexandria's website. Angela is 33 and lives in Richmond, VA.
Click here for Angela's website. Click here for Angela's Facebook page. Click here for Angela's Tumblr. Click here for Angela's Etsy shop. Bradon is 38 and lives in Los Angeles. Dom is 24 and lives in Philadelphia. Click here for Dom's website. Click here for Dom's Facebook page. Helen is 25 and lives in Weehawken, NJ. Click here for Helen's website. Click here for Helen's Facebook page. Click here for Helen's Tumblr page. Jeremy is 41 and lives in New York. Click here for Jeremy's website. Click here for Jeremy's Facebook page. Justin is 27 and lives in Raleigh, NC. Click here for Justin's website. Kahindo is 34 and lives in Chicago. Click here for the Modahnik website. Click here for Kahindo's facebook page. Karen Batts is 29 and lives in Queens. Click here for Karen's website. Click here for Karen's Facebook page. Ken is 24 and lives in Birmingham, Alabama. Click here to see Ken's website. Click Here for Ken's Facebook page. Miranda is 29 and lives in Wilton, Wisconsin. Click here to visit Miranda's website. Click here for Miranda's Facebook page. More About Project Runway Season 12 - Tim Gunn Joins Judges! Regular judges for season 12 are Heidi Klum, Nina Garcia, Zac Posen, and TIM GUNN. Also, for the first time in Project Runway history, Gunn will be able to “rescue” one designer during course of the season whom he feels deserves a second chance. Guest judges include Kate Bosworth, fashionista Kelly Osbourne, actress and comedienne Allison Williams, multiple Academy Award®, Emmy and Golden Globe® nominee Sigourney Weaver, TV stars Jesse Tyler Ferguson and Kaley Cuoco, as well as original Project Runway judge Michael Kors and Stacy Keibler, host of Lifetime’s Supermarket Superstar. In this season’s premiere, the sky is the limit as the designers are pushed and must fly on their own to create a look using parachute materials for their first runway challenge. "GoBank" provides $150,000 to the winner. "Resource Natural Spring Water" offers a year's supply of water and a luxury spa trip. The winner will have "A chance to design and sell an exclusive collection at Belk." Tide Pods provides a $100,000 fabric allowance. HP/Intel, Brother, Lexus, and L'Oreal are all returning as well. As part of the winner’s prize package, this season’s champion will receive $150,000 from GoBank, the award-winning new bank account made to be used on a mobile phone; $50,000 of next generation technology from HP and Intel to help enable their creativity and launch their new business; a year’s supply of Resource Natural Spring Water and an all-expense paid, luxurious spa retreat for two to the exotic Maldives, courtesy of Resource Water; a chance to design and sell an exclusive collection at Belk; a complete sewing and crafting studio from Brother Sewing and Embroidery; a fashion spread in Marie Claire magazine; a 2014 Lexus IS 350; a $100,000 fabric allowance from Tide Pods to inspire fashions that truly pop; and a $50,000 styling contract with L'Oréal Paris. It is a prize package worth more than half a million dollars. The model paired with the winner of Project Runway will receive a fashion spread in Marie Claire magazine and $25,000 from L'Oréal Paris. Sandro is 28 - originally from Russia - and lives in New York, NY. Click here for Sandro's Facebook page. Click here to learn more about Sandro. Sue Waller is 45 and lives in Brooklyn, NY. Click here to visit Sue's website. Click here to see more of Sue's designs. Click here to learn more about Sue. Timothy is 24 years old and lives in Milwaukee. Click here for Timothy's Facebook page. 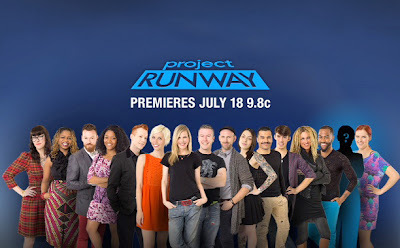 Project Runway Season 12 Premiere July 18! 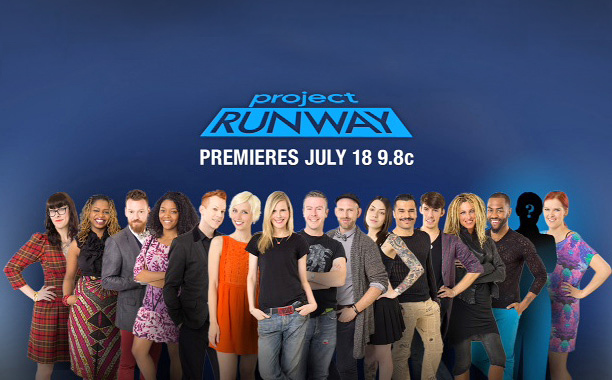 Sixteen designers enter the competition on July 18 for season 12 of Project Runway. Fifteen new designers and one returning designer hoping to earn "redemption." Good luck season 12 designers. We are counting down the days! Project Runway Season 1 Champion, Jay McCarroll is named "Fashion Ambassador" at New Jersey's Hamilton Mall. As its fashion ambassador, McCarroll will be hosting a number of events at the Hamilton Mall, beginning in August with the “Battle of the Runways,” aimed at back-to-school fashions. 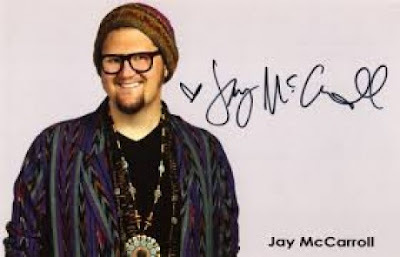 He will be designing a special T-shirt exclusively for Hamilton Mall, and will be writing an interactive column, “Ask Jay,” in the mall’s monthly newsletter. His first official appearance will be Friday, June 28, when he will be meeting and greeting shoppers at Never Too Spoiled, Hamilton Mall’s exclusive carrier of his amazing designs. More event announcements will be made in the coming months. Click here to shop Jay's designs online. Today is the final day to submit your video to be eligible for a makeover as part of a season 12 challenge. Tim Gunn Takes a "Field Trip" for a Season 12 Challenge. ETonline just posted an interview with Zac Posen. 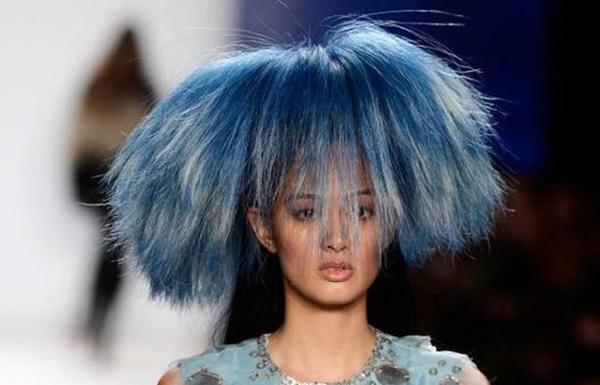 ETonline: You were great on Project Runway. Are you going to be back for season 12? Posen: I'm in the midst of filming! Posen: Really good! We started about a week and half ago, and it's been a very busy schedule. There's an incredible group of designers. They are driven -- they are passionate. It is going to be an incredible season for the fans who haven’t watched it in a few seasons. This is one to watch. ETonline: How do you find the time for Project Runway and designing? Posen: It's very challenging. Time management is an art. You switch mindsets. I try to leave my personal aesthetic at the door when I shoot Project Runway. The thing that I value more than anything else in the world is great teachers, and I've had amazing teachers in my life. 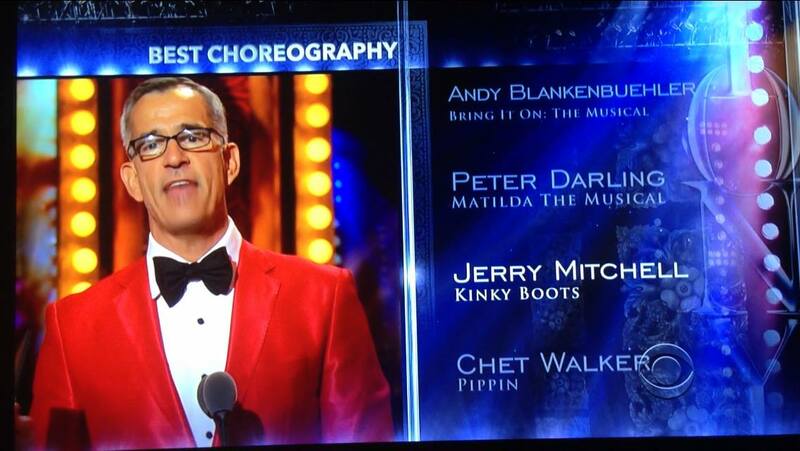 My father -- who's an artist -- has throughout my career, been an incredible critic. I think it became hereditary or through listening to him. I tried to bring that to the set with the objective to be fun, and to get the most out of each individual creator. But the designers are very talented, the challenges are very challenging, the time constraints are intense. The drama is high. 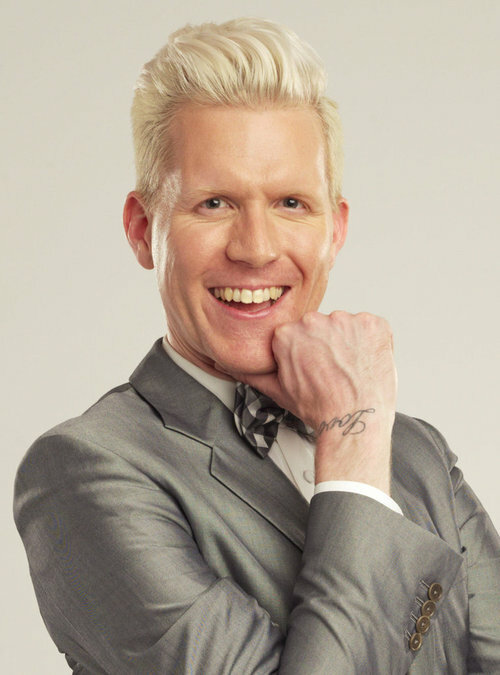 Project Runway Fans have chance to be featured in Season 12 Makeover! 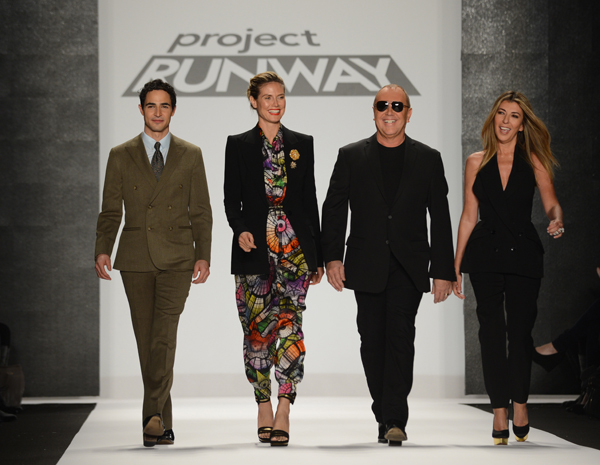 Are you a "Project Runway" fanatic? Submit your video telling us why you love "Project Runway" and deserve a new look, and be entered to win a chance to be featured in Season 12! Videos must be less than 30MB and must be uploaded by June 20. Good luck and make it work! Click here for more information and official rules. Project Runway Season 4 Champion, Christian Siriano, is among the 32 designers who were welcomed into the elite organization this year. 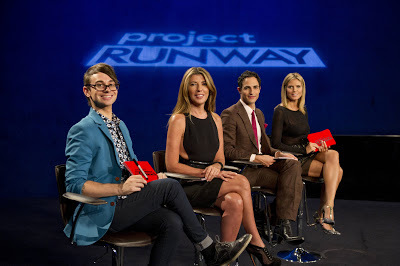 Project Runway Season 11 designer, Benjamin Mach, is profiled in a fresh new interview. You worked with Marchesa for the lovely Georgina Chapman. How was your experience there? Working with Georgina and Keren Craig when they were in the early years of developing their brand was one of the best London experiences I had. I learned a lot about myself when I was working with them and they were truly wonderful to be around. I have visited them in the New York atelier and it reminded me so much of the studio I was a part of in London magnified x100 !! I miss working with them, but we probably just went down different paths. I still keep in touch. Yahoo TV offers five reasons why Alyssa Milano is the ideal choice to host the show. Heidi's dress is Roland Mouret. 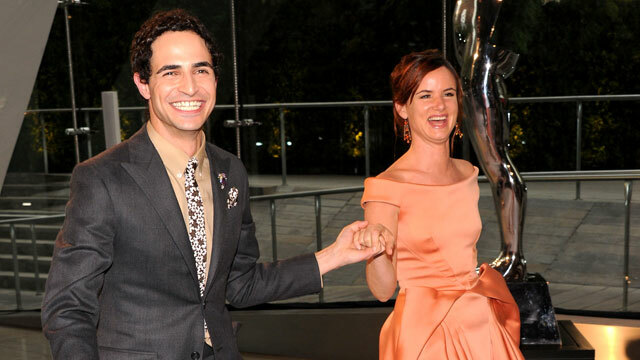 Zac Posen returns for Season 12! Will Michael Kors return for the finale? Project Runway Season 12 Filming Underway! Heidi Klum on "America's Got Talent"
Did you watch Heidi on AGT? What did you think? Heidi talks about her new role in a fresh interview here. Q: In what kind of role do you see yourself as a judge? A: I look at it as a woman, as a mom, someone who has seen a lot of shows. You know, I think about, "Hey, is this an act that is interesting? Is this something that I want to see again? Did that excite me? Would my children love to watch this?" Q: Do you have any specific criteria you are looking for? A: I love people that surprise me, that show me things I haven't seen before. Today we looked at this guy ... he's a sword swallower. He combined that with pole dancing. He was pole dancing with a sword down his throat and did that deadly drop that they do at the end sometimes, you know? With a sword in his mouth. ... We're jaded and we've seen so many things and you're looking for something that surprises you. 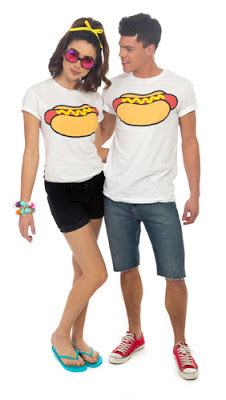 Click here to see the full collection on Style.com. Michelle Lesniak talks to "The Oregonian." "I do not plan on leaving Portland," the 34-year-old says. "There are no rules, and if there is a rule that one has to live in New York City or Los Angeles, I plan on breaking that rule." Also, For one thing, she and her husband are getting a divorce, which means she'll be going back to her family name, Lesniak. "It's very amicable," she says. "We put in 10 years of marriage." She is still waiting for her prizes! Her "Project Runway" victory was especially sweet, given that in the first several weeks of the season, she was on teams that consistently lost. She's still waiting, however, for delivery of her prizes, including $100,000, a 2013 Lexus GS 350 and a $50,000 technology suite by Hewlett-Packard and Intel. Georgina Chapman and Isaac Mizrahi are returning for season 3. Hard to believe, but Heidi is 40 today!